SUBHEAD: Free Flow Power is speculating and making claims through FERC to potential hydro sites in many places. 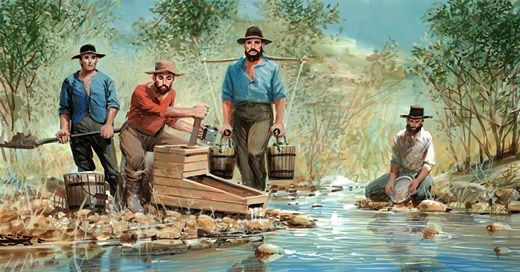 Image above: The 1849 Gold Rush wasted the streams and rivers of California. From (http://www.postalmuseum.si.edu/artofthestamp/subpage%20table%20images/artwork/history/Gold%20Rush/BIGgoldrush.htm). As "green energy" becomes more attractive, hydroelectric power is drawing more interest. By generating electricity and selling it to the grid, there is profit to be made from flowing water. Companies are prospecting claims on existing and potential dam sites, and one such example is Columbus' Griggs Dam on the Scioto River. Hydroelectric projects operate under license from the Department of Energy's Federal Energy Regulatory Commission (FERC). FERC uses a licensing process to regulate the hydroelectric industry. FERC applies terms and conditions in these licenses to control the design and operation of hydroelectric projects. Applications must meet criteria covering dam safety, environmental impacts, and other concerns. Licenses run 30 - 50 years, and they convey eminent domain to the license holder. According to the FERC website, "A preliminary permit, issued for up to three years, does not authorize construction; rather, it maintains priority of application for license (i.e., guaranteed first-to-file status) while the permittee studies the site and prepares to apply for a license." In other words, this preliminary permit lets a company place a claim on a potential hydroelectric site, similar to a prospector staking a claim on a parcel of land. This is happening now, at Griggs, in a process largely hidden from the public view. On March 25, 2009, the Julian Griggs Dam Water Power Project, LLC (JGDWPP) filed a Notice of Preliminary Permit Application to study the feasibility of a hydroelectric project at Griggs. FERC published acceptance of this application on August 6, 2009. FERC requires public disclosure of applications. According FERC's records, JGDWPP published their public notice re the application in the Northland News, one of the local neighborhood publications of Suburban News. However it seems no notice was published in the SN sister publications for Upper Arlington, Hilliard, Dublin, or Northwest Columbus. The Ohio Revised Code requires that public notices be published in a newspaper of general circulation. But JGDWPP published not in the city-wide Dispatch, but in a neighborhood newspaper whose circulation area does not cover Griggs. The application lists the major components of the project: "The proposed Julian Griggs Project would consist of: (1) The existing 67.5-foot-high, 983-foot-long concrete dam; (2) the existing 385-acre reservoir with a 4,322 acre-foot storage capacity; (3) a new 70-foot-long intake structure; (4) two new 70-foot-long, 120-inch- diameter penstocks; (5) a new powerhouse containing two proposed generating units with a total installed capacity of 4.0 megawatts; (6) a new 100-foot-long tailrace; (7) a new switchyard containing a single three-phase step-up transformer; and (8) a new 1,100-foot-long, 34.5- kilovolt overhead transmission line." All this would go somewhere in the existing park. In exchange for the public's loss of the land, an estimated annual output of 12,000 megawatt-hours would be sold to the grid by a private, for-profit company. Who would make this profit? The permit applicant is the Julian Griggs Dam Water Power Project, LLC, which was formed on March 16, 2009, but who is behind that entity? The Applicant Contact is Mr. Alan Skelly of Cincinnati. In a Google search for that name, the first result listed indicates he is the CEO of Ohio Power and Light, of Cincinnati. The Ohio Power and Light website shows little more than a transmission line, an electric meter, a flowing stream, and a woman carrying a child on a beach. A hydropower page on the site also says little. According to the documents associated with the FERC permit application, another agent and firm appear to be leading the effort. A Mr. Ramya Swaminathan is listed as the Managing Member of JGDWPP, LLC, but also, is shown as Vice-President, Project Development, for the firm Free Flow Power Corporation, located in Gloucester, Massachusetts. The Chairman of Free Flow Power Development LLC is Brig. Gen. (Ret.) Robert Crear, , who headed the Army Corps of Engineers' Mississippi Valley Division. Additionally, Mr. J. Mark Robinson serves as an Advisory Board member. According to an August 2009 press release, "Mr. Robinson retired in June as the Director of the Office of Energy Projects at the Federal Energy Regulatory Commission (FERC), where he was responsible for FERC's regulatory approval of new energy infrastructure development projects, including hydropower projects." The Free Flow Power website indicates two subdivisions, of which Free Flow Power Development, LLC, is responsible for developing hydroelectric projects, primarily on rivers. Their page lists these criteria for site selection: economies of scale, proximity to large consumers of energy, low environmental sensitivity, minimum flow, minimum depth, and absence of significant recreational use. While many who know the Scioto at Griggs might well agree that it often fits the criterion of "minimum flow," the environmental sensitivity and recreational use in the area would seem to rule it out. Yet the permit was sought. Griggs Dam is owned by the City of Columbus, and operated by the Department of Public Utilities, Division of Water and Power. An inquiry sent to Maintenance Manager Larry Krall brought this response: "Reply from my administration 'City is aware of this application and of other applications for this site and another City owned dam, and it is our understanding that there are several, mostly newly formed, companies mining state dam inventories and filing permit applications for any dam they think might be capable of supporting a hydroelectric facility. Although these companies can file for permits without the owner's knowledge or consent no facilities can be built without the owner's consent, and at this time the City has no plans to develop or allow the development of hydroelectric plants at any more of its dams.' Thank you for your interest." It is unclear whether the public-comment period for the FERC permit ends on October 7 or 17. While the City stands against this project "at this time" the secretive pursuit of this permit makes it unlikely that many other objections have been raised. And, the City might be persuaded to approve, if there is a sufficient monetary incentive. Development is a compromise between competing interests, and FERC weighs public concerns and comments in its permitting and licensing terms and conditions. Across the table are the formidable resources of a major hydroelectric energy player. It's a contest between green recreation vs. green profits, and the integrity of our parkland is at risk. Looks like same going there as Kauai. Hi Juan, do you think other people have same problem at the Post A Comment that I had? Maybe under Post a Comment you could put those same directions you gave me? Better than that I've simply moved the comment box onto the post page. Hope this works for everybody. And sorry for those who got frustrated by the buggyess. How shall FFP and Kiuc be "stopped"? Maybe someone skilled in law should be involved. What about Earthjustice? I don't trust the State as they're the ones who allowed the Kekaha shrimp farm to each day discharge millions of gallons of sewerage into the Pacific. It should be the Kiuc members but it seems the management pulled the wool over their eyes. And blinded them with soothing rhetoric. Its all well and good to huff and puff but "if you can't blow the house down" it ain't worth a hill of beans if you can't stop them legally. Even if FFP and Kiuc can only be delayed. We're Baaack! - online that is.